Luis Figo would consider a bigger World Cup if he is elected to replace Sepp Blater as Fifa president. Releasing his manifesto at Wembley Stadium, the legendary Portugal midfielder said he would look at increasing the number of teams from 32 to 40 or even 48. 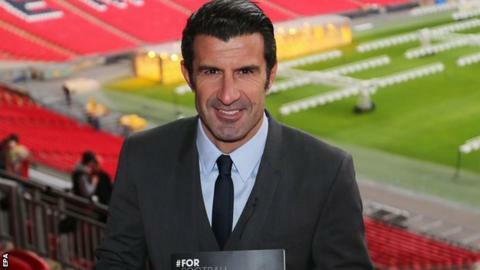 Figo, 42, is one of three candidates challenging Blatter in the election on 29 May. He also proposed sin-bins and reverting to the old offside rule interpretation. Dutch federation president Michael van Praag and Jordanian Prince Ali bin Al Hussein are also in the running to become head of football's world governing body. Former Barcelona, Real Madrid and Inter Milan winger Figo, who played at two World Cups, said on Thursday that the current format could be increased to 40 teams or Fifa could stage two 24-team competitions simultaneously on two continents, followed by a knockout phase in one nation. He said: "Both these options are feasible with an extra three to four days of tournament play. If this expansion were to take place I believe that additional teams should come from non-European nations. "We not only make sure that we include more countries from across the world, but also enable Fifa to raise significant increased revenues that can be used to invest in the growth of the game globally." Spreading half of Fifa's $2.5bn revenue over four years to associations to fund grassroots football. Redistributing $1bn of Fifa's $1.5bn cash reserves to the 209 national federations. Increased use of technology in the game, using sin-bins for unsporting behaviour. Reverting back to the previous interpretation of the offside rule, "where a player is judged offside whether directly involved in the play or not". Blatter, 78, has been Fifa boss since 1998 and said in June 2014 that he intended to run for a fifth term. He was criticised for Fifa's handling of Michael Garcia's report into alleged corruption during the bidding process for the 2018 and 2022 World Cups.